Do you ever read those celebrity mags? I read them at the salon or doctor's office and my favorite section is, "Celebrities: They're just like us!" with photos of famous people buying groceries, picking up dry cleaning, chasing their kids, going for a run, just being normal people. It's so silly. Of course people who happen to have a job that makes them famous also do human things. So, it's equally silly to go to a modern city like Dublin and to expect the young, hip knitters to be any different than the rest. We're a global society now with social media bringing us all together. We knit the same things, covet the same yarns, and queue the same patterns on Ravelry. We chat about this during my visit to This is Knit for episode 77 of the VeryPink Knits Podcast. I enjoyed visiting with Jenny and Lisa and know that if I ever was able to stay in Dublin a while longer I could go there for knitting night and find fast friends. I enjoyed browsing through the shop and feeling the yarns, some brands I don't get to see often in the US. 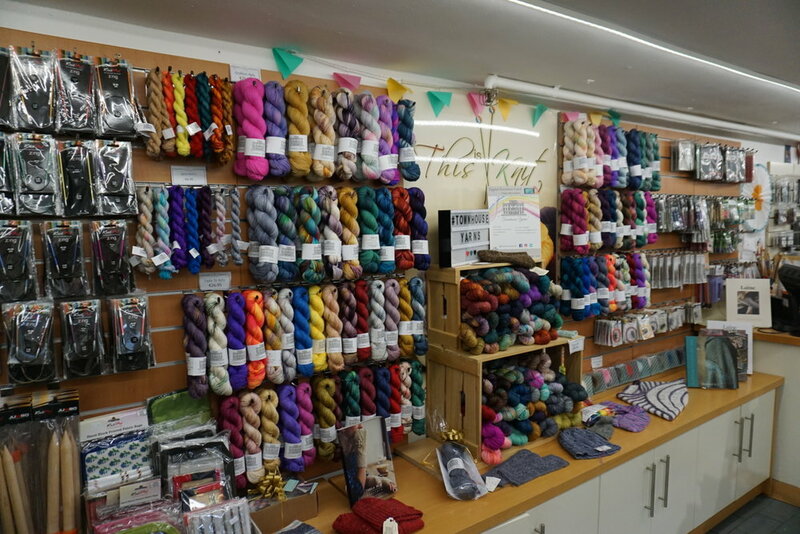 The PomPom Magazine trunk show was visiting the shop and together we ooh'd over the gorgeous shawl in the photo above. Enjoy more photos of the Powerscourt Townhouse as well as Jenny's hand-dyed yarns.